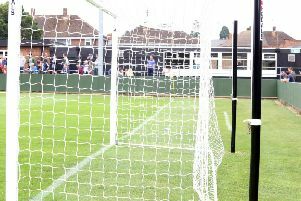 Andy Peaks felt the “fine margins” went against AFC Rushden & Diamonds after their play-off hopes were all-but ended by a 2-1 defeat to Stourbridge at Hayden Road. Diamonds were in a ‘must win’ situation as they took on the second-placed Glassboys in their bid to keep their chances of finishing in the top five alive. They took the lead through Nathan Hicks but were pegged back by Rob Thompson-Brown’s strike 10 minutes before half-time. And it was Stourbridge who went home with all three points after Luke Benbow hit what proved to be the winner with 15 minutes to go. It all left Diamonds boss Peaks feeling somewhat perplexed after he felt his team had matched the long-time title contenders for the majority of the game. “I thought we played pretty well to be honest,” Peaks said. “We made changes and I think we went into it a bit more attack-minded. In general, I thought we were very positive in our approach. “Our problem recently has been scoring goals but we scored a good one to get ourselves in front. “But their first goal was the real killer moment because we should have been going in 1-0 up and the manner in which they scored gave them a big lift. “And in the second half they are able to bring someone like Luke Benbow off the bench and he is class and he’s got the goal for them. 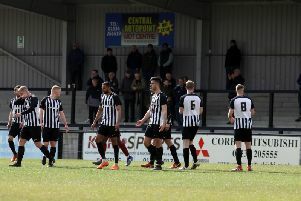 Diamonds now have a week to prepare for the Easter weekend double-header which sees them head to Coalville Town on Saturday before hosting local rivals Kettering Town a week tomorrow.